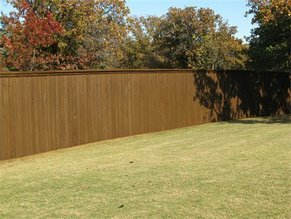 Why should you choose us for fence staining in McKinney? Simple. Professional fence staining is our speciality! While some competing fence companies in DFW treat fence staining as an afterthought, we do things a little differently and it shows. We deal exclusively in fence staining! This philosophy makes us the only complete fence staining company in McKinney. 24 hour emergency help available upon request! Call 972-897-5422 for pricing, quotes and more. Areas and suburbs in DFW served include Plano, Frisco, Garland, Richardson, Allen TX, McKinney, Carrollton, Lewisville, Desoto, Irving, Mesquite, Rowlett, Rockwall and more.